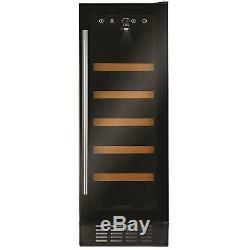 FWC303BL Freestanding/ under counter slimline wine cooler. 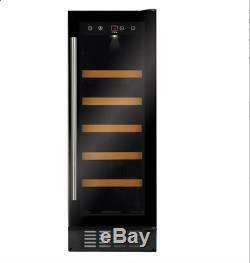 The FWC303BL is a freestanding, under counter, 30cm wine cooler with great capability within a stylish exterior. 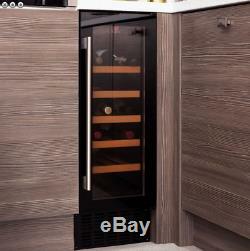 Features include: wooden slide out shelves with the capacity to hold 20 bottles, electronic temperature control, a UV protected smoked toughened glass door, a humidifier and a temperature alarm to maintain optimum conditions for the safe storage of your wine; this is the perfect addition to any functional kitchen design. 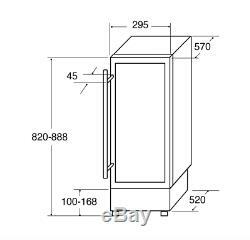 UV-protective smoked toughened glass door. Humidifier to maintain 50-80% RH. Display colour/type: Red, touch control. Exterior colour of cabinet: Black. Interior colour of cabinet: Black. Interior light (type and quantity): 1x 15W white LED lighting. Glass shelves (pack of 3), AFG31. Temperature range: 5 to 22°C. Power cable length: 1.8m. Energy consumption per annum: 139kW. The item "CDA FWC303BL 30cm 20 Bottle Free Standing Under Counter Wine Cooler In Black" is in sale since Wednesday, February 28, 2018.